Nowadays, having a global perspective is becoming an increasingly sought-after skill that international law firms and legal departments are seeking out. Individuals who can bring an international perspective to their teams are able to apply their unsurpassable legal knowledge to complex international transactions. Today—and more than ever—professionals who possess such skills are in high-demand. The LL.M. in International Business Law transforms students into global lawyers and business strategists. 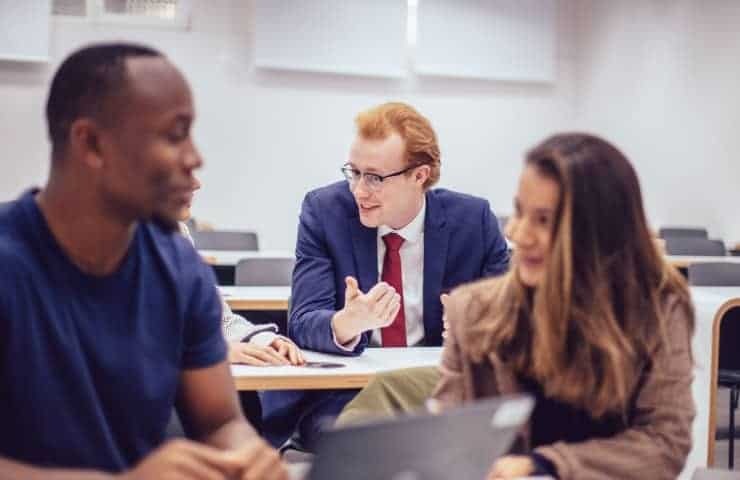 Carefully devised to incorporate both soft and critical skills, we are able to guide our students on their journey to a successful career in international business law. We expect our students to exceed legal boundaries and excel within a global legal system. We promote an innovative way of thinking and we encourage our students to break down the barriers and reap in the success of their skills and abilities. We cannot stress enough the importance of gaining experience in real-world situations. How else are we truly able to understand the ins and outs of the professional world? With this in mind, students of the LL.M. in International Business and Law have access to a number of enriching possibilities, enhancing their portfolios and helping them to stand out from the rest. As part of the program, you’ll have the opportunity to take part in legal venture clinics, as well as a practical case methodology where you’ll work alongside large global companies, international law firms, and organizations—including those from the governmental, non-governmental, and public sectors. It doesn’t stop there either with the Brussels and London International Immersion Weeks offering you the opportunity to meet with the heads of the world’s most prestigious international firms and in-house departments. What’s more, you’ll be positioned within London’s legal marketplace where you’ll engage in captivating meetings with London’s top lawyers. We promote an innovative way of thinking and we encourage our students to break down the barriers and reap in the success of their skills and abilities. We promise to provide you with a holistic and dynamic approach to learning. Over the course of 10 months, you will study eight fundamental modules to provide you with an in-depth and well-rounded comprehension of international business law. We encourage you to take the wheel and truly immerse yourself in the program experience as this is your chance to truly flourish and take your learning to new levels. We have also included a Soft Skills & Experiences module to ensure you have a multifaceted skill set to help you get ahead when entering the job market. IE Law School is committed to fostering a global legal education so that our students are prepared to work on an international platform, managing trans-border transactions and multijurisdictional issues. We are proud to present our new partnership with Barbri, the number one bar examination review course in the United States. This unique partnership offers students the opportunity to study U.S. law and acquire the credentials needed to make global legal practice a reality. Barbri’s International Bar Preparation program has been specifically designed to guide non-U.S. qualified lawyers towards passing the California Bar Examination. This allows students to qualify as a U.S. attorney and bridge the gap between legal environments in our increasingly globalized, interdependent world. Does this program sound like what you need to reach new professional heights? Contact us today for more information.